Evacuate! It's The Tropical Tsunami Water Slide! Have your own backyard tsunami, with the 22ft. Tropical Tsunami Water Slide for rent at your next party. Feast your eyes on the bright vivid colors of this inflatable water slide with attached pool. At 22ft. high it is sure to attract attention with a giant wave on the top and cool tropical palm trees at the bottom. Not only is this the tallest water slide in our inventory, it is also the fastest! Guests will be linig up to take turns climbing their way up to the top, where the steep angle of the slide will get their adrenaline pumping! Get ready to get wet, sliding through the misting system and splashing into the pool below. 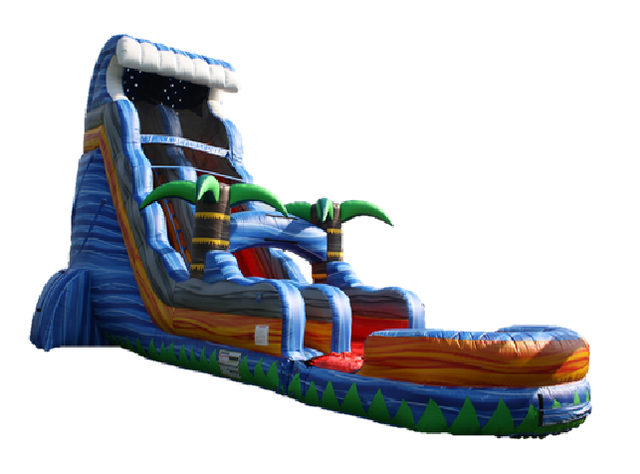 Add some water fun and rent the Tropical Tsunami Water Slide with the pool for family gatherings, birthday parties, BBQ's, church events or just staycations during the hot summer days.